Once again, the Legal Marketing Association (LMA) Annual Conference was a huge success. If you attended, legal marketing zombies may have chased you throughout the exhibit area. But no worries – attendees could always take a respite in the “zombie-free zone” at the Jaffe booth, where we encouraged our colleagues to avoid a legal marketing apocalypse by following our survival tips. There was a myriad of breakout sessions that could help legal marketers fill their arsenals with sound and progressive tactics that will ensure increased ROI. One session that was of particular interest to me was entitled “5 Steps to Bridge the Generational Gap in Law Firms,” presented by Nicole Abboud, Iris Jones and Danyel Patrick. Each speaker focused on a different generational perspective: millennials, Generation X and baby boomers. In case your eyes have glazed over from early onset of the zombie infection outbreak, I’ll recount the “generalized” characteristics of each group. Millennials - Born between 1981 and 2002, these youngsters are often characterized as entitled, addicted to social media, tech-savvy and wanting to understand the “why” as much as the “how.” They need to be a part of the process as much as the outcome, and they want recognition for their contributions. Gen Xers – Their birthdates range from 1965 to 1980, and they are often referred to as “slackers,” impatient, skeptical and cynical. This latchkey generation demands freedom, responsibility and work-life balance. Interestingly, many believe that they are the key to bridging the generation gap, since they often encompass characteristics from the generations both before and after them. 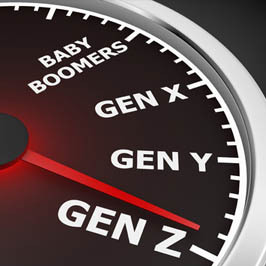 Baby Boomers – The elder statespeople of the workforce, or just the old folks if you’re a millennial, this goal-oriented and independent group was born between 1946 and 1964 and are believed to have the strongest work ethic. In fact, it is often said that baby boomers live to work. They are competitive and focused on money, titles and power. How can you take a workforce of such seemingly different types and build a stronger, cohesive and more manageable law firm? I believe the keys are communication (listening as much as or more than talking), inclusion and respect for difference, or vive la difference. I know this may seem impossible, but it simply cannot be an impossibility at any firm, because time marches on and change is inevitable. Let’s look at a few of the arguments that arise from generational conflict and their counter perspectives to help get a handle on this issue. Millennials want inclusion in the process and recognition for their contributions. Why not include them in client matter meetings from the onset, instead of having only senior partners determine a course of action and then assign research and brief-production to associates without them understanding the importance of their contributions? Yes, you may have to write off a few hours of associate time, but that is training for the younger attorney and an investment in the bench strength of the firm. Additionally, you might just be surprised at the innovative perspectives that millennials bring to the table. I also must jump on my soapbox here and remind everyone that giving recognition is free for the firm – and just the right thing to do. If an associate does all of the research and prepares the first draft of a bylined article for a partner, then their name should also appear on the byline. You are not only giving the person the recognition they need for job satisfaction; you are also helping the younger attorney garner exposure in the marketplace, and that is good for the firm. That brings us to the so-called slackers, those Gen Xers sitting around riding the clock, waiting to beat a path to the parking garage. Let’s remember that many of these individuals were latchkey kids, rising early for school and retuning home to an empty house with plenty of homework, sometimes siblings to attend to and dinner to start while their work-weary parent(s) commuted home. This group learned responsibility out of necessity and is adept at getting things done. They do value freedom and work-life balance, but these are fairly easy to accommodate. It’s time to give these people the responsibility they want, and the authority to match that responsibility. These younger partners are the heirs apparent to running the firm. Give them the freedom to take on leadership roles and get out of their way. It’s much better to do so now, while they have more senior attorneys to turn to for advice. Now a look at our baby boomers, those competitive, workaholic senior partners who built the firm at 60+ hours a week, 52 weeks a year, and are never going to let you forget it. You will have to pry clients out of their cold, dead hands unless the firm’s competitors get to them first. Let’s not even talk about having any real input into firm governance with this group – you don’t. That’s how it looks from the lower rungs on the ladder, and sadly, that’s how it often really is. But it doesn’t have to be that way. I’ve worked with many gracious senior partners who relish mentoring and sharing their incredible knowledge with younger generations. Instead of griping and complaining that the old goats won’t simply go out to pasture, make sure that your law firm is taking advantage of their invaluable institutional knowledge, valuing and incentivizing their roles. Yes, I said “incentivizing”: This group is money-motivated! Perhaps their compensation should be geared more toward rewarding mentoring and turning over client responsibility than continuing to hold onto so many billable hours. Again, I refer back to the keys to understanding and appreciation amongst the generations: communication, inclusion and respect for differences. I encourage you to think about each of these keys, and check them off as you work to bridge generational gaps at your firm. For more information or help with bridging the generational gap at your law firm, contact me, Terry M. Isner at tisner@jaffepr.com.